November is a month of transition. As the evenings cool, the water temperature drops from the 70's into the mid to lower 60's. The fish seem to know they need to "put on the feed bag" to prepare for the lean months of winter. As the water temperature drops, it also clears and the red fish begin forming large, winter schools. At this time of year we typically time trips around the low tide. The low tide concentrates the fish, they form large schools, stay as shallow as they can to feed and for protection from their primary predator, the bottle nose dolphin. Here is a video I made last year showing Capt. John Bottko in the middle of several schools of over 100 red fish. November and December can be two of the best months of the year to fish for reds. The water is cool, clear, the fish are in big schools and they need to eat. Drop a St. Simons Scampi in front of one of them and usually they grab it and take off. 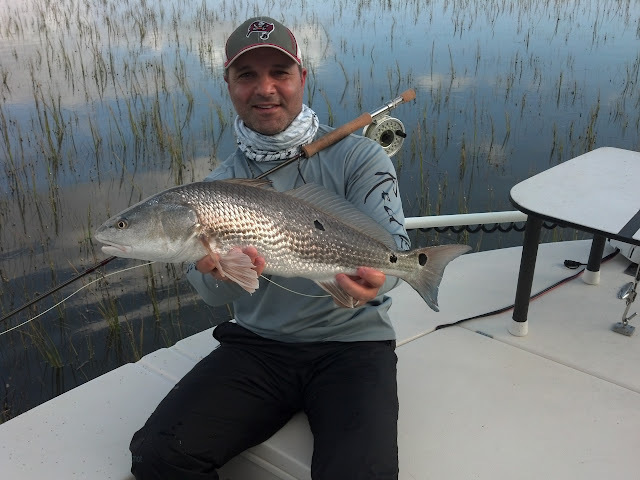 There are plenty of 5-10 lb red fish around to give your rod a good bend, and while most of these fish will stay in the marsh for at least another year or two, there is some concern for the future. Many of the guides I talk to say the "rat reds" that spawned last year are very scarce. This is my observation as well. The lack of these first year fish is a concern for next year and the year after that. As a result, if you are fishing for Red Fish in the Golden Isles this Fall, please consider limiting your catch rather than catching your limit. Trout fishing will continue to be great until the water cools into the 50's. In November the trout are bigger and more aggressive than they were earlier in the year. I love trout fishing in November. The fish are schooled up and many times you get a bite on every cast. So, if you find yourself in the Golden Isles sometime over the next two months, give me a call, and let's go "Hunt Fish in the Marshes of Glynn." While the main story was fishing to tailing red fish last month, you can only do that on certain days. You can sight fish to red fish on the low tide almost every day. Low tide fishing is different from fishing to tailers. Normally we do not see the fish tailing. If the water is clear enough, we look for the fish in the water. If we can't actually see the fish, we fish to the pushes and bow wakes these fish make while swimming around. I had a few days off last month between high tides, and decided to try out an ultra shrimp tied by one of my clients. This was during the neap tides, and the water was clear enough to see the fish. I cast to several fish, and was lucky enough to get some of them to eat. On one cast in particular, I remember casting to a pod of three or four fish, and watching them all race to see who could be the first to the fly. The winner is pictured below. The Ultra Shrimp has earned a place in my fly box. Ultra Shrimp, low tide red fish. I had a few anglers fish the low tide this month. Andy had never caught a red fish on a fly, nor had he ever caught a fish strong enough that he had to clear the line and fight a fish on the reel. Andy had a red fish savagely attack a Purple Passion. After some hastily yelled coaching, he got the fish onto the Orvis Mirage reel, and let the drag take over. Later he commented the fish pulled out line so fast, his fingers were burned from the friction. All the more reason to learn how to fight a fish on the reel. Andy's first red fish. The trip was a birthday present from his wife, Marina. While we let the fish go, I think Marina is a keeper. Take a look at the link in the article below to the Tips and Techniques page of my web site. There is some good information on catching and fighting our big, strong reds that will help you avoid some common problems I see while I am on the water. I don't mean to re-hash subjects of previous newsletters, but I see some common problems so often, that I think it is a good idea to do a quick review of some essentials. 1. While casts are not necessarily long, they need to be accurate. If you can double haul or single haul and shoot on the presentation, you increase your odds of catching a fish. 2. Strip Strike!!!! Do not raise the rod tip when you set the hook. This is a very hard habit for freshwater trout fisher-people to break. 3. Most of the time, you have to fight these fish on the reel. Learn to clear the line and get the fish on the reel. 4. You have to be stealthy. Wear soft bottomed shoes. There is no faster way of scaring off red fish on the low tide than banging on the bottom of the boat. We are all excited when we go out, and it is hard to remember proper casting and fish fighting techniques. Yard practice will help, particularly with muscle memory for casting. But the best way to learn to catch these fish is to do it. 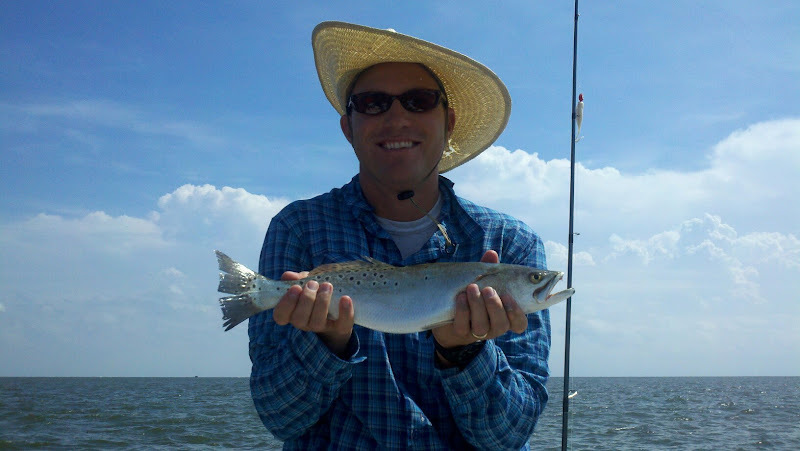 So, come on down to St. Simons and catch some of our late fall and early winter red fish and trout. Keep up with all the fishing news in the Golden Isles of Georgia. Click the block above to be added to the mailing list. Newsletters are sent out every four to six weeks. If there are some significant happenings, I will send one out only when necessary. I hate spam as much as you do. Check out and Like Fly Cast Charters on Facebook. I have recently added many more pictures. 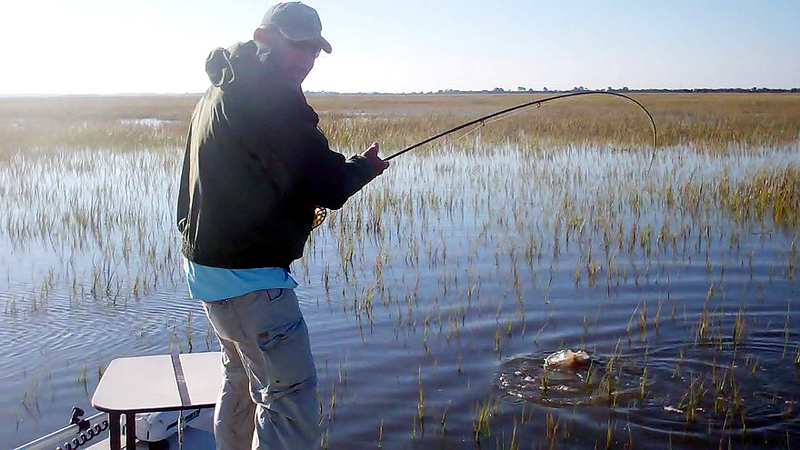 There are several videos on fishing in the Marshes of Glynn. Check it out. Capt. 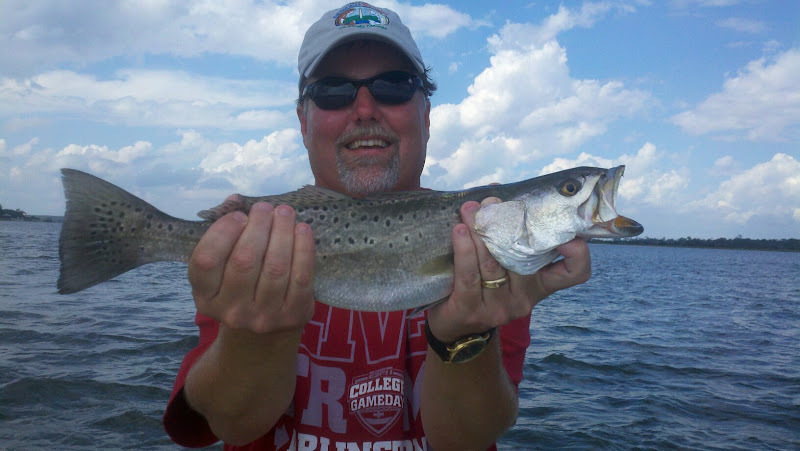 David Edens is an Orvis Endorsed Fly Fishing guide as well as a Federation of Fly Fishers Certified Casting Instructor. This assures you of a quality trip and instruction. October is considered by most fishermen to be the best month to fish in the Golden Isles of Georgia. October weather is much more comfortable than September weather with more moderate temperatures and much lower humidity. This October lived up to its reputation of great fishing and weather. The month started with the Cystic Fibrosis Red/Trout tournament. I had several good anglers on the boat. We boated over fifty "keeper" trout in two days, and released at least a hundred undersized fish. There were twenty six boats in the tournament. My boat came in sixth overall, so imagine how many fish were caught by the top five boats!! On the last day Capt. Mike Evans, whose team won the tournament, released over one-hundred legal trout. This is a "no kill" tournament, so all the fish caught were released to fight another day. The trout population seems to have recovered from the freezes of 2010 and 2011. By now you all know my favorite fishing is tailing red fish in the grass. The tides didn't come in on the full moon the first part of October, but the fishing during the New Moon tides during the middle of the month was off the charts. While there might have been a few more fish the middle of September, the fishing in October was fantastic. Shots at ten to thirty fish on a tide were common. As I have said before, if you can put your fly in front of these fish they will eat. The casts aren't terribly long, but you have to be accurate. Those experienced anglers who put flies in front of fish, caught fish. Some of the less experienced anglers, caught fish and all of them gained experience. I also had several anglers who had never caught a fish strong enough to have to fight on the reel or who had never had to strip strike lose fish. (I lost count of how many fish were missed because the angler gently raised the rod tip to set the hook. 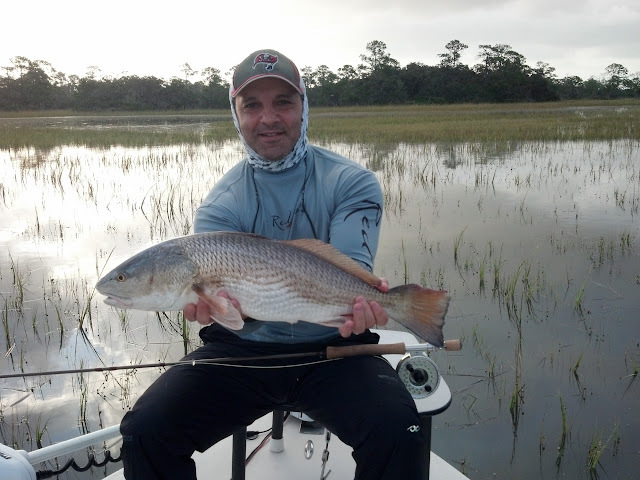 When you gently raise the rod tip on a red fish, most of the time you gently slide the hook out of his mouth.) I distinctly remember one angler hooking a huge fish, clamping down on the line and having the hook tear free. There are some tips and techniques in the side column that tell how to avoid common mistakes in catching and fighting our strong red fish. Several captains who fish for the spawning bull reds have reported good catches; and while fishing with DOA's or bait for trout, my anglers caught several nice flounder. October has been a grand month of fishing. November is coming, and with it the big schools of winter time red fish. These big schools offer a different challenge. See the November and Winter Fishing Outlook in the side column of this newsletter to see what we have to look forward to. Thanks to everyone of you who fished with me this month. I hope you enjoyed October as much as I did. Work is currently underway to add a ramp and office space for Capt. 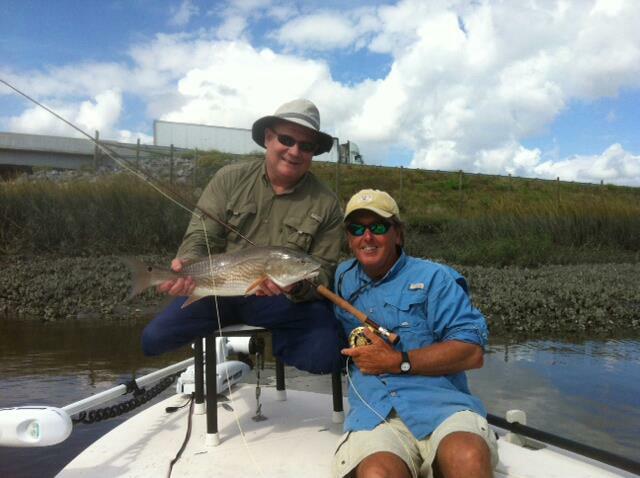 Larry, who is the father of fly fishing in the Golden Isles. As most of you know by now, Larry is a dear friend, who suffered a stroke earlier this summer. We are all looking forward to having Larry back in the shop. Not only will it help him in his re-hab, it will help us all knowing he is doing much better. In the mean time, he is working on his "Semper-Fi" flies project, and his wife Ellen, with the help of some good friends, is managing the shop. I was in the shop earlier today, and it is full of great gift items and new fishing flies and tying supplies. Make sure you stop by and check it out when you are in St. Simons. Who knows, Capt. Larry might be back at work when you stop by. That would be a treat. www.flycastcharters.com. Not only are there up to date fishing reports, I am constantly adding new photos, information and videos. 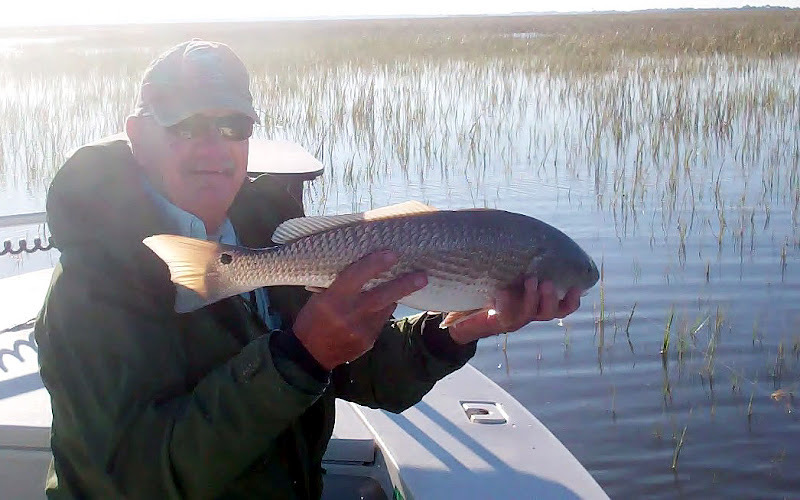 Fish the Golden Isles, and call me to enjoy, "Hunting Fish in the Marshes of Glynn".